Communism has been one of the most influential economic theories of all times; recognizing its influence is key to understanding both past and current events. Moreover, the competition between communism and capitalism as played out in the Cold War was arguably the defining struggle of the 20th century. 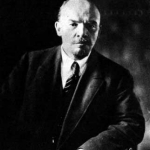 This section provides a brief overview of communist ideology in the European and Russian contexts and includes information on the rise of the Soviet Union under Vladimir Lenin and its continuation under Joseph Stalin. It concludes with an explanation of the tensions that surfaced at the end of World War II between the United States and the U.S.S.R. that led to the Cold War. Communism is a political ideology and type of government in which the state owns the major resources in a society, including property, means of production, education, agriculture and transportation. Basically, communism proposes a society in which everyone shares the benefits of labor equally, and eliminates the class system through redistribution of on income. The Father of Communism, Karl Marx, a German philosopher and economist, proposed this new ideology in his Communist Manifesto, which he wrote with Friedrich Engels in 1848. The manifesto emphasized the importance of class struggle in every historical society, and the dangerous instability capitalism created. Though it did outline some basic requirements for a communist society, the manifesto was largely analytical of historical events that led to its necessity and suggested the system’s ultimate goals, but did not concretely provide instructions for setting up a communist government. 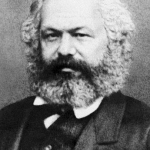 Though Marx died well before a government tested his theories, his writings, in conjunction with a rising disgruntled working class across Europe, did immediately influence revolutionary industrial workers throughout Europe who created an international labor movement. As envisioned by Marx, Communism was to be a global movement, inspiring and expediting inevitable working-class revolutions throughout the capitalist world. Though the book had not yet been published, these revolutions had already started in early 1848 in France. The new urban working class that lived and worked in terrible conditions throughout Europe got fed up with their life of squalor as they saw upper-class citizens (the bourgeois as Marx labeled them in the Manifesto) living lives of luxury. The ideas and goals of communism appealed strongly to the revolutionaries even after the 1848 revolutions collapsed. For the next several decades, fed-up lower class workers and peasants held tight to the legacy of the 1848 revolutionaries and communist ideology waiting for the right moment to capitalize. Communism was adopted in Russia after the Russian Revolution, a series of revolutions that lasted throughout 1917. For centuries leading up to World War I, Russia was ruled by an absolute monarchy under which the lower classes had long suffered in poverty. This tension was exacerbated by the nationwide famine and loss of human lives as a result of World War I. The first revolution began when the Russian army was sent in to control a protest led by factory workers who had recently lost their jobs. However, the army did not follow the Czar’s orders and many soldiers defected and protested in solidarity with the workers. The military quickly lost control of the situation, and the Czar was forced to abdicate. The Imperial Parliament formed a provisional government, but Vladimir Lenin’s Bolshevik party overthrew it in October 1917. Bolshevik leaders appointed themselves to many high offices and started implementing communist practices based on Marx’s ideology. When the Czar was dethroned, Vladimir Lenin returned to Russia after being exiled for anti-Czar plots. Other revolutionaries including Leon Trotsky also returned to Russia to seize the opportunity. The two established the Bolshevik party, a communist party that was staunchly opposed to the War, which continued to wreak havoc on the unstable nation. The Bolshevik’s anti-war platform was popular among the Russian people, and Lenin used this momentum to overthrow the provisional government, take control of the country and pull Russia out of the war. Lenin also promised “Bread, Land and Peace” to the large populations affected by the famine, further increasing the party’s popularity. However, when the Bolsheviks gained only 25 percent of votes in the 1917 elections, Lenin overturned the results and used military force to prevent democratic assembly. He established several state-centered government programs and policies that would continue, in some form, throughout the reign of the Soviet Union. His plan for national economic recovery, the GOLERO Plan was the first of this type and was designed to stimulate the economy by brining electricity to the whole of Russia. Lenin established a national free healthcare system and free public education. He also established the Cheka, a secret police force to defend the success of the Russian Revolution and censor and control anti-Bolshevik newspapers and activists. Following two failed assassination attempts, Lenin, following a suggestion from a military leader named Joseph Stalin, authorized the start of the Red Terror, an execution order of former government officials under the Czar and Provisional Government, as well as the royal family. 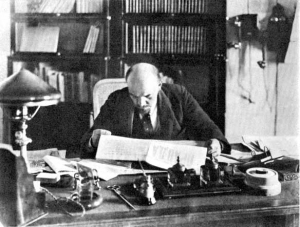 Lenin at work in the Kremlin. Shortly thereafter, the country dissolved into civil war between the ruling Bolsheviks and the White Guard, a loose alliance of anti-Bolshevik parties including tsarists, right-wing parties, nationalists and anti-communist left-wing parties. Both sides engaged in terror tactics against each other included mass executions and the establishment of Prisoner of War labor camps, and wreaked havoc on the country’s already-weak agricultural and economic system. Following the end of the war in 1921, Lenin established the New Economic Policy, which allowed for private businesses and a market economy, despite its direct contradiction with Marxist ideology. He also annexed Armenia, Georgia and Azerbaijan to provide geographic and political protection from the Party’s political and ideological enemies. He died in January 1924 of a heart attack. After his death, several members of the Communist Party’s executive committee, the Politburo, vied for control of the government. 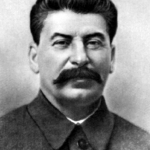 Joseph Stalin, born Ioseb Besarionis Dze Jugashvili (in his native Georgian), was a key military leader throughout the Red Terror and the Civil War. As you learned, Stalin actually proposed the idea of fighting the Communist Party’s enemies through systematic mass terror and killings to Lenin. As General Secretary under Lenin, he also oversaw brutal military actions throughout the civil war and led the 1921 invasion of Georgia to overthrow an unfriendly social-democratic government. In Georgia, Stalin took the lead in establishing a Bolshevik regime in the country hard-line policies that forcefully repressed any communist opposition. Lenin disagreed with Stalin’s tactics in Georgia, and right before his death dictated notes in his Testament warning of Stalin’s excessive ambition and obsession with power, and advised that he be removed from the General Secretary position. However, Lenin died shortly thereafter and Stalin allied himself with several other Politburo members to suppress Lenin’s Testament and remain in a position of power. Over the next few years, Stalin isolated his major opponents in the Communist Party, eventually throwing them out, and became the unchallenged leader of the Soviet Union. He officially ruled the country from 1924-1953. In his early years as leader, Stalin revamped the Soviet Union’s economic policy, replacing Lenin’s New Economy Policy with a highly centralized command economy controlled by the state, which rapidly industrialized the country. However, the quick transition from agriculture to industry disrupted food supply and caused a massive famine lasting from 1932 to 1933. Simultaneously, people deemed to be political enemies began being imprisoned in labor camps or deported to remote areas of Russia. In 1934, actions against political enemies, including members of the Communist Party who disagreed with Stalin’s policies, intensified with the start of the Great Purge. About one million people were executed from 1934 to 1940 under Stalin’s orders. In 1939, Stalin signed a Non-Aggression Pact with Nazi Germany’s Adolf Hitler. However, when Hitler broke the pact and invaded in 1941, the Soviet Union joined the western Allies in their battle against the Nazis. With the United States other allied European countries leading the charge on the Western Front and Stalin pushing back from the East, the Nazis were defeated with the Soviet Red Army’s capture of Berlin in May, and the western armies’ D-Day invasion in June 1944.